No catamaran builder has won more world and national championships in offshore racing or set more kilo speed records than Douglas Marine. Legendary craftsman Peter Hledin builds some of the worlds fastest catamaran boats available today and recently set the record as the world’s fastest powerboat with a Skater 36′ boat that topped 180 mph. The family of world-class Skater Power Boats includes 10 models from 28 to 50 ft. All are built for speed, whether they are for the recreational/pleasure racer or the serious professional. Douglas Marine was the first to perfect the use of vacuumbagging technology, using carbon fiber and kevlar laminates along with Plascore PP Honeycomb to build many of its floors, partitions, hatches and related components in these high performance boats. Always looking for additional opportunities, Douglas Marine also uses the core with less costly E-glass construction to line the bottoms of hydraulic tilt trailers. The product, being inert and impervious to salt water, has replaced the old steal tread and aluminum diamond plate previously used. Once again Plascore PP Honeycomb proves its versatility with cost savings and features for the builder and customer. 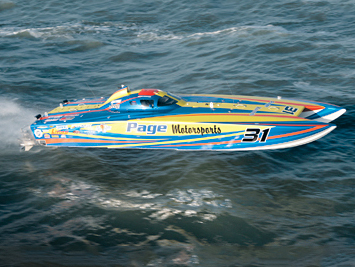 For more information visit Douglas Marine and Skater Power Boats at www.skaterpowerboats.com..